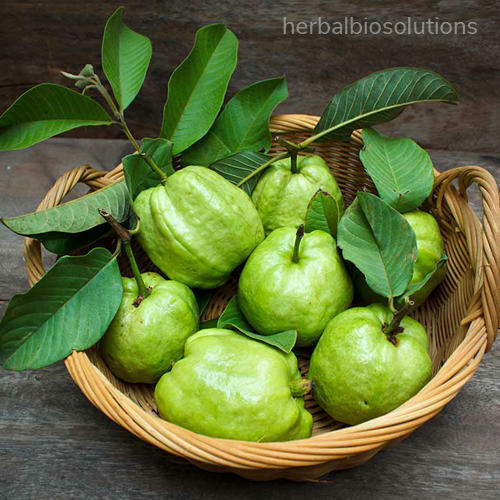 The guava plant (Psidium Guajava) is native to Central America, Mexico, and South America and is now being grown in the tropics and subtropics of Africa, Southeast Asia, South Asia, the Caribbean, and several other regions. Guava Leaves Health BenefitsGuava plant leaves are best known as a natural pain reliever. They contain polyphenols, flavonoids, and carotenoids, which makes them useful in treating numerous diseases and conditions. Commenced in the year 2007 Herbal Bio Solutions (A Unit Of Scientific International) is the dominant Manufacturer, Exporter and Wholesaler firm gaining worldwide recognizance for offering best in class range of Herbal Extracts. With over a decade of domain expertise, we are continuing to present a wide assortment of much anticipated products, such as Herbal Extracts, Essential Oils and Brazilian Natural Extracts. Our pioneering repute is backed with the grown profit lines that we have attained by presenting a diversified product range featuring beneficial attributes of purity, higher efficacy, unmatched quality standards, hygienic processing and longer shelf life.We are exporting of quality products in Mexico, African Country and Gulf Country. Our significant growth is backed with positive feedbacks that we receive from our global clientele for delivering a trustworthy product range. Further, the vast knowledge and expertise of our team members enable us to garner the challenging product demands for medicinal, cooking and agricultural use. To provide a range of industry approved products, we make sure to procure most genuine quality herbs and raw materials from authorized sources. The additional trait of our strong domain expertise and vigil approach is that our products are free from impurities and processed in controlled environments. Further, our manufacturing practices are based on cutting edge technology that enables us to process finest grade of extracts while keeping the goodness of nature intact.